The Carl Vinson Institute of Government has served state and local governments for more than 90 years. 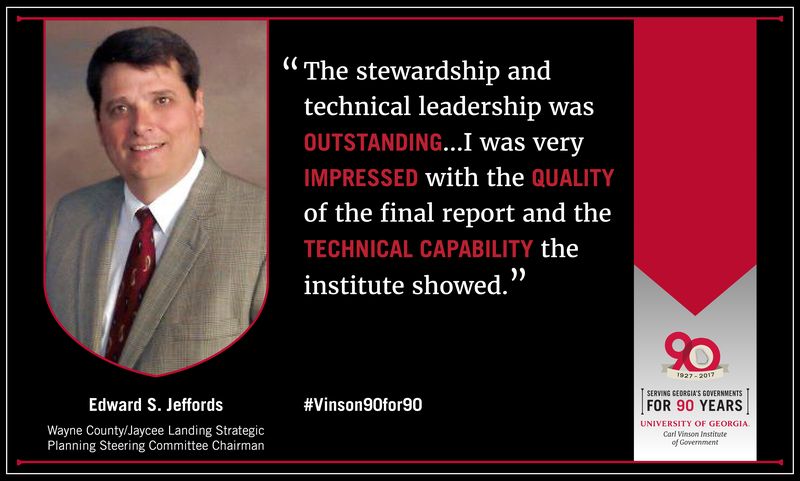 We celebrated our 90th Anniversary year in 2017 and are proud to share testimonials from our clients, stakeholders and friends. The testimonies below show the projects we have worked on, the lives we have touched and the impact we have made in Georgia and beyond. Click to view full testimonial. In what ways or types of project work has the University of Georgia's Carl Vinson Institute of Government served you and your government? 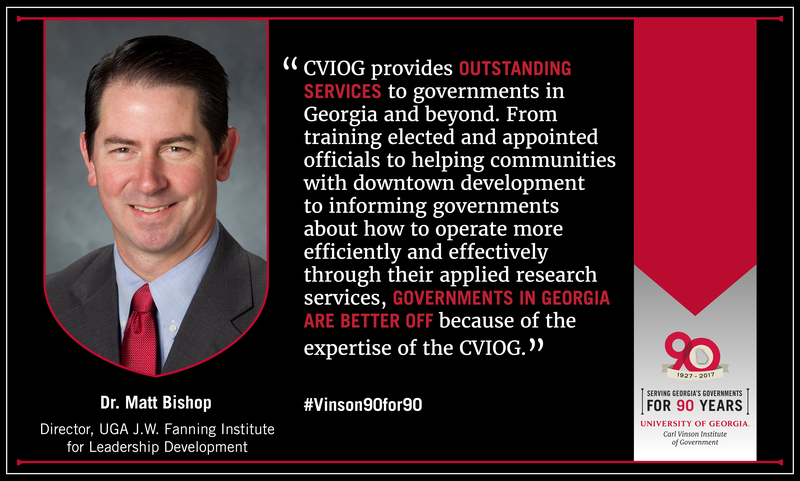 The Carl Vinson Institute, beyond providing excellent training for our staff and myself through the Georgia Municipal Association, has assisted our city in advertising and selecting two City Managers. Both provide us with great leadership. Please share any positive impressions made by the Institute faculty and staff on you and your government. The members of the CVIOG staff have impressed me with their thoroughness and interest to detail in the projects they are working on. I had the privilege to travel with some of the staff on a trip to China and South Korea. Their ability to relate to the leaders of colleges, government agencies, as well as the leadership of major corporations such as Kia, was very impressive. What type of impact has the work of the Institute made on your government? What evidence can you share of positive change made as a result of the Institute’s work? As mentioned above, the staff helped us in choosing the two City Managers we have had, both of which brought excellent abilities and have made our city government work more efficiently. It has been a great experience to get to know many of the staff at CVIOG. Each of them is very approachable, personable, efficient and dedicated to the work they do. I am fortunate to call them friends. In what ways or types of project work has the University of Georgia's Carl Vinson Institute of Government served you and your organization? The Carl Vinson Institute performed a study on implementing a "gateway" to the Altamaha River at the Jaycee Landing in Wayne County. Please share any positive impressions made by the Institute faculty and staff on you and your organization. The stewardship and technical leadership was outstanding. The Carl Vinson team implemented a community outreach program, as well as provided technical research to help formulate a vision for a nature/educational center and illustrating a plan for enhancing the landing facilities. I was very impressed with the quality of the final report and the technical capability the institute showed. What type of impact has the work of the Institute made on your organization? What evidence can you share of positive change made as a result of the Institute’s work? The impact was great. [There was a] lot of community support and buy-in for the vision by the community, which was due, in large part, to the quality of work done by the Carl Vinson team. The Institute team [leadership] was outstanding, with insight on the possibilities and keeping the study on track for a deliverable. Also, I am impressed with the commitment of the Institute to this region of the state. This commitment showed up in all aspects of the study, from financial to resources and invaluable networking. The Institute also has continued with their commitment with follow-up work on this vision. 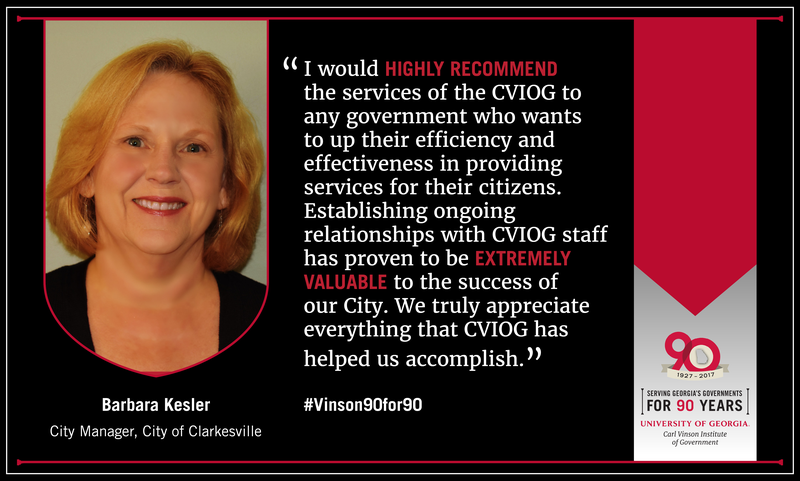 CVIOG led a Renaissance Strategic Vision & Plan resulting in a Master Plan for the City of Clarkesville that the City continues to use in all of our planning efforts. CVIOG also led a planning retreat in 2016 for the mayor and council. Danny Bivins and all of the staff from the CVIOG that worked on the Master Plan were outstanding. Danny in particular has remained in close contact with City staff and is one of our biggest supporters, which we greatly appreciate. His positive attitude and the knowledge that he so freely shares has contributed to the City's ability to rise to a new level of planning and accomplishment. Gordon Maner, who led our retreat, was exceptional. He was able to lead us through challenging discussions and made us a better functioning team. We accomplish projects in a more efficient and cost-effective manner. Our decision-making is based on concrete planning for both the short term and the long term. We have more confidence now than in the past. For example, we have completed the rebuild of the section of the downtown square that was destroyed in a 2014 fire. We obtained a dilapidated, abandoned property one block off of the square, tore down the buildings and created additional parking, ridding the city of a decades-old eyesore. The Streetscape project should be completed by the end of summer  and we have major improvements to our water/sewer system. I would highly recommend the services of the CVIOG to any government who wants to up their efficiency and effectiveness in providing services for their citizens. 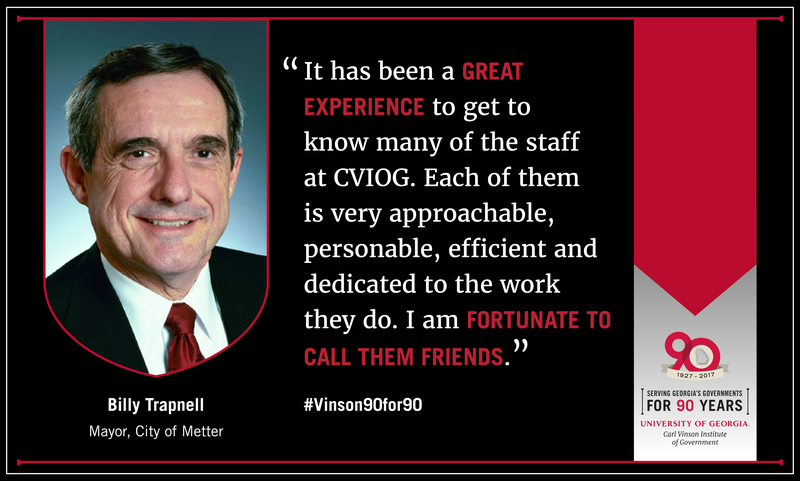 Establishing ongoing relationships with CVIOG staff has proven to be extremely valuable to the success of our City. We truly appreciate everything that CVIOG has helped us accomplish. I am currently participating in the Global Leadership Training Program in the International Center of The Carl Vinson Institute of Government. I was able to learn about the public administration system and the operation of the local government in the U.S. Their professional knowledge and a diverse international sense contributed to my professional development significantly. In addition to the assistance to my professional development, the staff and faculty in the International Center helped me with difficulties we faced here. Especially when my wife had a broken finger, one of the staff members helped her in the hospital as if it was her own family issue. I really appreciate it. The Institute is helping me with my research related to improving the autonomy of local governments in Korea. The lessons I learned from here include the HR (human resources) management techniques and strategies that will help the HR management in local governments in Korea. The Institute is also helping with my survey in relation to my research on local autonomy in Georgia. 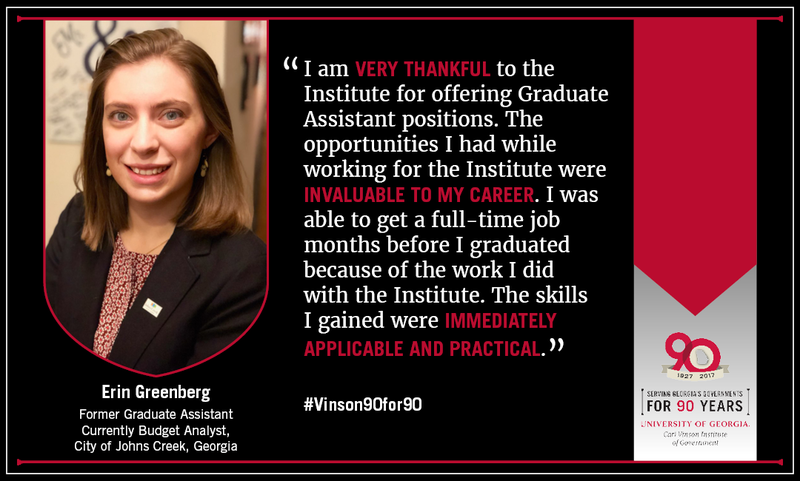 CVIOG is a "sister" unit of public service and outreach to the Fanning Institute here at UGA. Our faculty and staff collaborate on many projects, trainings, initiatives, etc., particularly as it relates to developing leaders across Georgia. We have worked closely with GTED [the training arm of the Institute of Government] on a variety of initiatives and trainings, and I'm always impressed with the professionalism and expertise of the faculty. Additionally, I can't say enough about the faculty and staff of the International Center. I traveled with Rusty Brooks and Fei Zhang to China in 2012 and had an amazing cultural and professional experience. CVIOG provides outstanding services to governments in Georgia and beyond. From training elected and appointed officials to helping communities with downtown development to informing governments about how to operate more efficiently and effectively through their applied research services, governments in Georgia are better off because of the expertise of CVIOG. In what ways or types of project work has the University of Georgia's Carl Vinson Institute of Government served you and your agency? 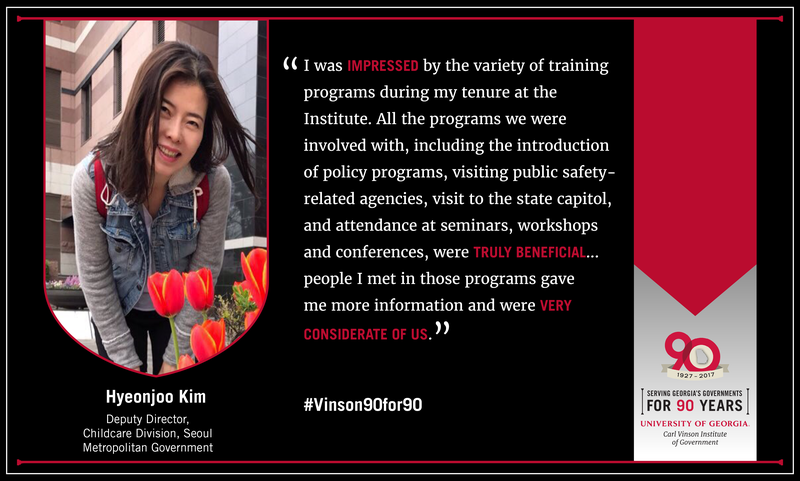 Since the Carl Vinson Institute provides Seoul Metropolitan Government officials with the most suitable internship for each purpose of training and gives us information on the training program actively and friendly, it is the most preferred organization for Seoul Metropolitan Government officials. Moreover, the institute is considerably contributing to the policy exchanges between Seoul Metropolitan City and Georgia, such as promoting the agreement for policy exchange with autonomous districts of Seoul Metropolitan Government. Please share any positive impressions made by the Institute faculty and staff on you and your agency. I was impressed by the variety of training programs during my tenure at the Institute. All the programs we were involved with, including the introduction of policy programs, visiting public safety-related agencies, visit to the state capitol, and attendance at seminars, workshops and conferences, were truly beneficial and people I met in those programs gave me more information and were very considerate of us. The contents learned from these programs were quite different from those of the Seoul Metropolitan Government and some of these were significantly applied to the process of planning policies in SMG later. What type of impact has the work of the Institute made on your agency? What evidence can you share of positive change made as a result of the Institute’s work? Although it is difficult to prove direct change or effect, the Carl Vinson Institute of Government would be the closest partner to Seoul Metropolitan Government among other foreign training institutions we may have. The Vinson Institute is regarded as a sincere partner for the policy cooperation of the Seoul Metropolitan Government and I would like to thank Dr. Rusty Brooks and Dr. Taesik Yun, who are actively promoting partnerships and bridging the administrative cooperation between the Seoul Metropolitan Government and the state of Georgia of the U.S. 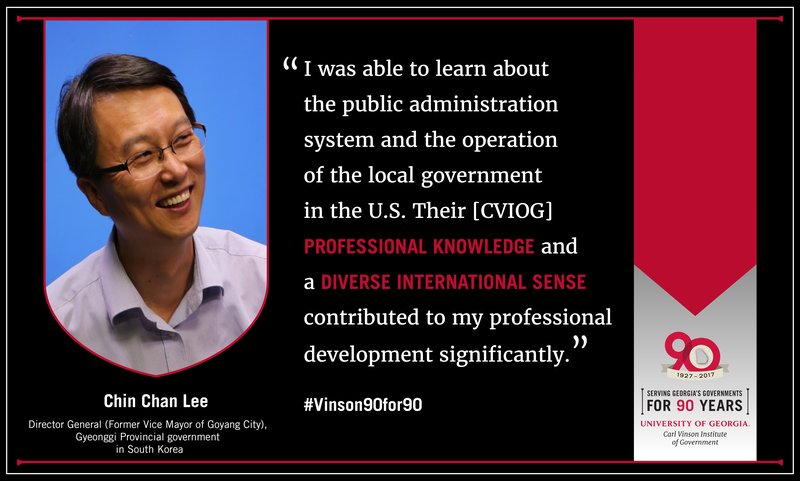 I sincerely congratulate the 90th anniversary of the Carl Vinson Institute of Government and hope the institute plays a leading role in the policy exchange and development between major cities worldwide. For years, our organization has dealt with a multitude of CVIOG meeting planners representing such organizations as the Georgia City-County Management Association. These meeting planners are adept at their profession, making it more likely that associated events go off without a hitch. Also, the International Center has provided interns, as well as exchange forums, with international delegations. All of our dealings have been highly satisfactory. The interns have contributed to the CVB and have even participated in our strategic planning retreats, offering valid suggestions. One of our dealings with the International Center resulted in a trip to Seoul, South Korea, and I offered ideas to officials there about how their tourism infrastructure could be improved and took away ideas from them, too. The relationship with the International Center has allowed our CVB to reap unique suggestions not normally made available to a CVB of our size. This international perspective is indeed valued. 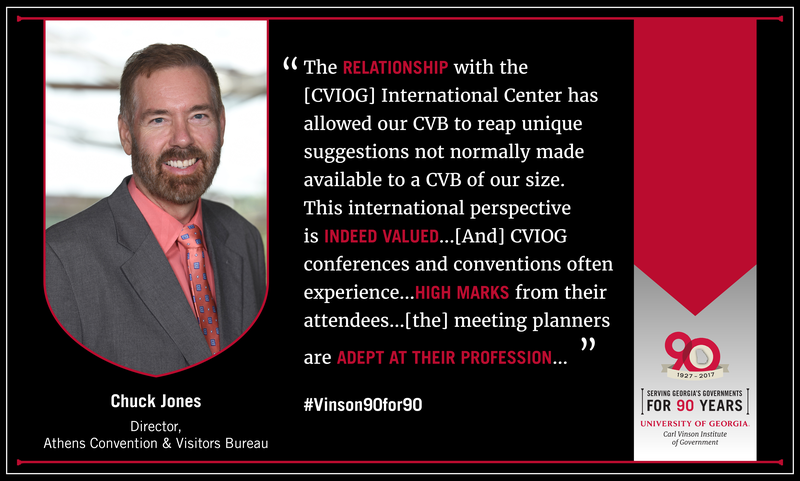 CVIOG conferences and conventions often experience an increased number of attendees and high marks from their attendees. The Carl Vinson Institute provided Seoul Metropolitan Government officials with the opportunity to learn about the theory and practice of public administration of local governments in Georgia. CVIOG also supported exchange between Seoul Metropolitan and other cities in Georgia, including the collaborative partnership between Seodaemun District and Athens-Clarke County of Georgia. Director Laura Meadows and Associate Director Rusty Brooks constantly show their support and hospitality for officials from Seoul Metropolitan Government, so that our colleagues can successfully complete their training and research in a comfortable and stable environment. My experience with CVIOG was memorable and invaluable, thanks to their continued support and guidance. Professor Steve Condrey also kindly helped my settlement in 2004 when I first visited the institution. 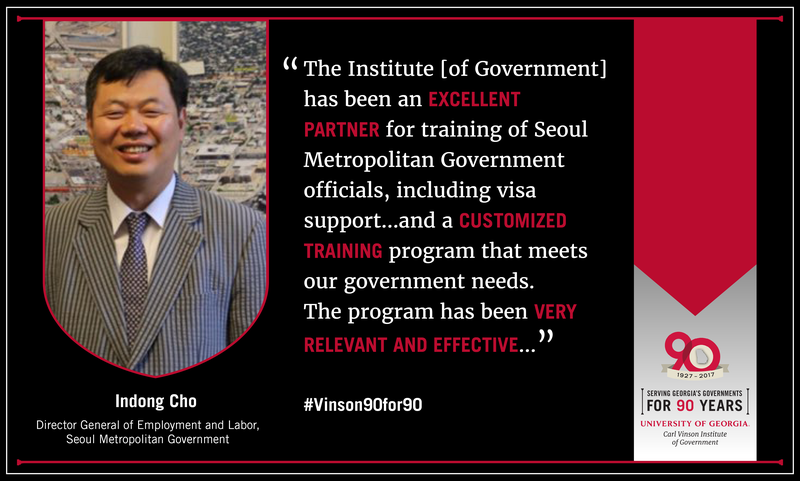 The Institute has been an excellent partner for training of Seoul Metropolitan Government officials, including visa support for two years and a customized training program that meets our government needs. The CVIOG program has been very relevant and effective compared to other programs we have partnered with. They also provide various opportunities for our officials to meet and learn [about] local and state officials in Georgia. I sincerely wish the Institute and the International Center a prosperity [will prosper]. I hope that the members of the Carl Vinson Institute will have more opportunities to visit Seoul and to meet with Seoul Metropolitan Government officials for more partnership in the future. UGA/CVIOG assists our department with statewide hospital training logistics. We have the pleasure of working with a great team, who exemplifies professionalism, teamwork, and accuracy. The team consists of Beverly Johnson, Katherine Davis, Lori Hawkeswood, Arlana Bowen, Michael Moryc, Deborah Barron, and Suzette Arnold. The Institute has a positive impact, by way of hospital training support. This entails registration, contract negotiations, Continuing Education Units (CEUs) process, etc. 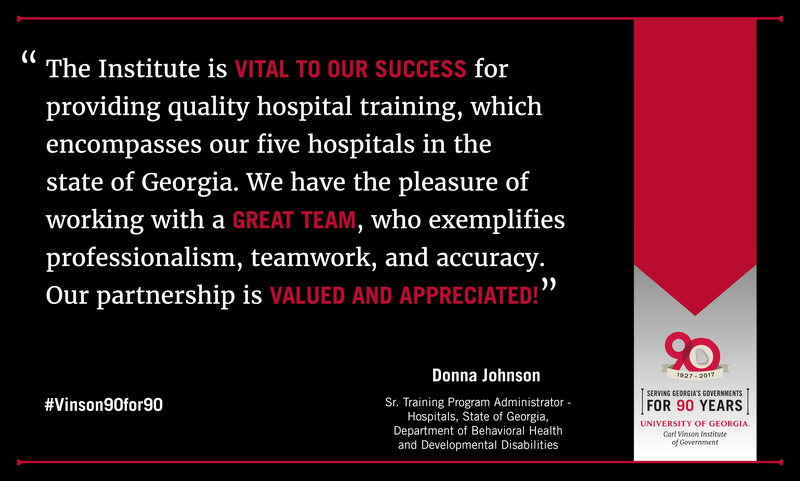 The Institute is vital to our success for providing quality hospital training, which encompass our five (5) hospitals in the state of Georgia. Our partnership is valued and appreciated! Travis Stegall walked into the Georgia Certified Economic Developer (GCED) program’s Agribusiness class not realizing he would leave with a sunny idea that could produce opportunities for years to come. The Georgia Certified Economic Developer program, started by the University of Georgia’s Carl Vinson Institute of Government in 2016, offers a variety of class topics to help those involved with economic development in Georgia. One class that showed up in the available curriculum was a little out of his comfort zone: Agribusiness. A guest speaker during the class talked about alternative energy and how it is used in farming. Stegall began to wonder how he could provide this energy and level of service to low-to-moderate income families in his community. With a poverty rate of 42 percent in Brunswick, alternative energy could change many households. Stegall walked out of the class thinking outside the economic development box. Stegall has now created an alternative energy model that people haven’t thought of in the past, one that could unite public and private partnerships. And he’s not just thinking of how he can benefit his city. He realizes that this model could benefit Georgia, the United States and the world. “This little class in Tifton, Georgia, has that impact,” Stegall said. Read Travis Stegall’s full success story here. 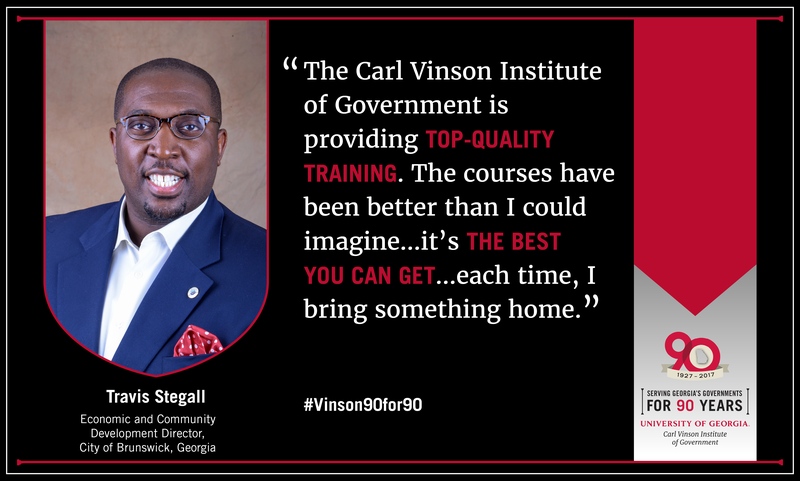 What was the focus of your work with the UGA Carl Vinson Institute of Government? I assisted Mara Shaw with planning several Georgia City-County Management Association conferences (fall 2016, spring 2017, and fall 2017). I compiled a study of other state associations and researched their conferences (what types of classes they offered, times of classes, speakers, order of conference, etc.) and used that information to offer the GCCMA planning committee a comprehensive vision for the 2017 conferences. This vision included many of the ICMA (International City/County Management Association) core competencies that had not been addressed in recent GCCMA conferences. Please share any positive impressions made by the Institute faculty and staff on you. Mara Shaw and Stacy Jones were incredibly supportive of me during my graduate assistantship. My second semester was very intense - I had just gotten married, I had a full-time load of classes, I started part-time at Johns Creek, I was a GRA for Mara, I interned with Athens-Clarke County, and I was commuting from Sandy Springs. Both of these women worked with me on my schedule and work load, and they did everything they could to help me succeed. I am very grateful for their support. What were the skills you gained while working at the Institute of Government and how have they prepared you for your current or future employment? Working these conferences pushed me out of my shell and gave me a chance to practice my own networking (which led to my job at Johns Creek). The assistantship also helped me develop research, memo writing, and presentation skills. Finally, the conference planning pushed me to work effectively and efficiently under pressure and intense deadlines. All of these skills are useful when preparing a budget for a city that is complete and accurate for presentation to the Council. I am very thankful to the Institute for offering Graduate Assistant positions. The opportunities I had while working for the Institute were invaluable to my career. I was able to get a full-time job months before I graduated because of the work I did with the Institute. The skills I gained were immediately applicable and practical. I highly recommend other graduate students to seek an assistantship with the Institute if they have the ability to do so. As a short-term training program during July and August 2013 for the research of public policy. All of them, the dean, James, Fei Zhang and Hong Zeng, etc. are all very kind and responsible. We've benefitted a lot from the program which was developed carefully by the team. They paid attention to the quality and the effects of the program. During the decision-making [training sessions], we learned about a lot of experiences of risks evaluation in the US. After [we returned to Shanghai from] the training, we shared some methods and ideas of risks evaluation of public policy with the public offices in [our own] local government in Shanghai. [We now pay more attention] to the risks evaluation of public policy which have solved many conflicts from the beginning during the decision making [process in our local Shanghai government]. Hope our two institutes can have more cooperation in training programs, policy consulting and other fields. Wish Carl Vinson Institute of Government will develop more useful programs about city management in the future. Congratulations to the Carl Vinson Institute of Government. As a short-term visiting scholar during August 2016 through January 2017. I benefitted a lot from the CVIOG in researching public management. All of them, Dr. Laura Meadows, Dr. Rusty Brooks, Dr. Rainey, Dr. Nesbit, Fei Zhang and Hong Zeng are very friendly to us. They are professional and profound. I've benefitted a lot from them, especially from Rusty, Fei Zhang and Hong Zeng. They are considerate and comprehensive to my research. They have all become my dedicated teachers and dynamic friends. 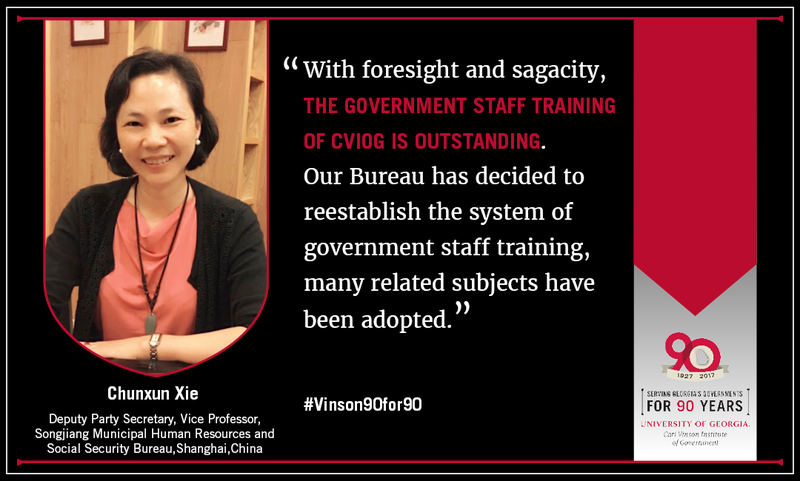 With foresight and sagacity, the government staff training of the CVIOG is outstanding. Our Bureau has decided to reestablish the system of government staff training and many related subjects have been adopted. 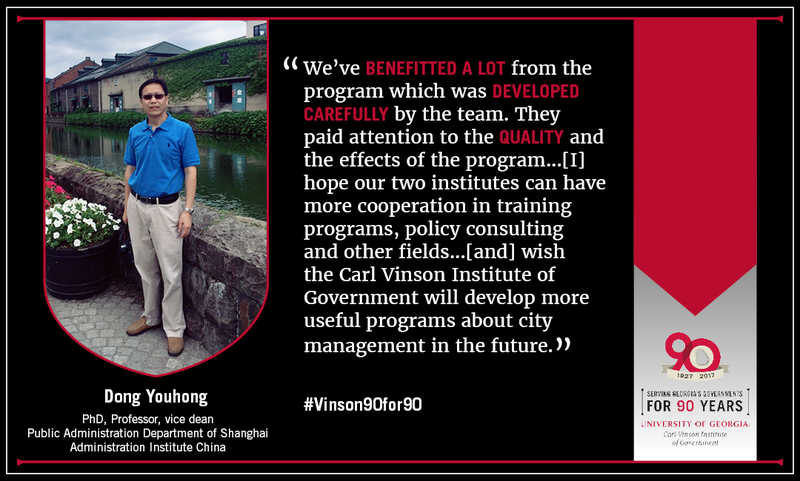 Congratulations to the Carl Vinson Institute of Government on its 90th Anniversary! Hope to meet the faculty of Carl Vinson Institute of Government in Shanghai soon.